The head of Afghanistan’s High Peace Council — a government panel tasked with negotiating an end to the country’s conflict with the Taliban – has died at the age of 84. Abdul Khabir Ochqun, the deputy head of the council, told RFE/RL’s Radio Free Afghanistan that Council Chief Pir Sayed Ahmed Gailani died at a hospital in Kabul at 7:45 p.m. local time in Kabul on January 21 as a result of an illness. Afghan President Ashraf Ghani is expected to appoint Gailani’s replacement. However it was not immediately clear who Gailani’s successor would be. Gailani rose to prominence during the Soviet invasion of Afghanistan in the 1980s as a resistance leader and the founder of the National Islamic Front of Afghanistan — one of seven U.S.-backed groups that fought against the Soviet invaders. Gailani had been a strong proponent of peace talks between the government in Kabul and Taliban militants. 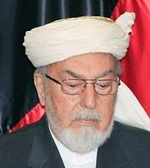 The previous head of Afghanistan’s High Peace Council, former Afghan President Burhanuddin Rabbani, was assassinated by a suicide bomber in 2011.